What does success look like to you? As an author? For your book? The Author’s Guild recently reporting that authors’ and writers’ earnings had plummeted from 2009 to 2014. The full-time author/writer was making an average of $17,500 – down from $25,000. The part-timer, was making $4,500 – down from $7,250 per year. With the 2014 Federal Poverty Level for a single person at $11,670, there has to be a better way … and there is. Hang out with other authors. When my first book was three months from its June publishing date, I was speaking on a cruise. One of the other speakers had made the New York Times list with her first book. Taking me under her wing, in three hours, I got a listen my new author and you will hear an earful scolding. Oh my, did I get an earful—it was a “kind” earful, not a true scolding. Will, kinda. And work I did. My takeaway was significant and has been the guiding force with all my book strategies: If it’s to be, it’s up to me. If your game plan is to publish and be successful, what’s in it? 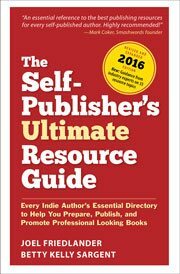 Have you identified who’s on your publishing team? Book cover and interior designers and editors? What format will you use for print, ebook, even an audio book possibility? Do you know how and where you are going to launch your book? How about blogs and top influencers in your genre and topic—are you following them? Have you studied the covers and books of the bestsellers in your category? What makes them shine … and what can you emulate to carry to yours? If fiction is your thing, think series. Many fiction authors will tell you that it’s not book #1 or #2 that creates the SuperFans—it’s the third that gets their attention. You are not a one book pony; you are an author who is here to stay, one that they will invest their time in … waiting for the next book. I’m a huge believer in mentoring. Just showing up at conferences and being present; working one-on-one with a few that you connect with, guiding through the publishing maze; sharing tips—ones that work and the ones that you thought were so awesome and bomb—are significant guideposts for authors in every stage. At a recent work shop that I did on how to create a speech around a book. I featured one of the authors I had been The Book Shepherd for. She had brought a case of her books to give away. There was a string attached. If a book was taken, the receiver agreed to post a book review. Speaking to the group about her book for two minutes (it’s all I gave her), 20 hands quickly shot up committing to read and review. Nice. Speak on your book, on your expertise. After publishing 18 books with New York houses, I broke away and start my own indie publishing house. Learning the business and knowing that the dramatic changes in tradition publishing are generating less and less in the royalty payouts, I’ve never looked back. The #1 thing that sold over a million books for me, that supported my family, paid for my kids’ education, and so much more was this: SPEAK. Crafting a speech and/or workshop around your book and expertise propelled me around the world connecting with millions was the secret sauce. Learn how to market your book and yourself. Authors need … no must … get over the “I would rather be writing” syndrome that so many embrace. Writing is a small fraction of your book success—it’s the marketing that will seed it, fertilize it, and accelerate its growth. Yes, you may be a superb writer. Do you have any idea how many wonderful books have been written that quickly died before a single shoot could surface? Too many to count. Book success comes from the author’s commitment to practice the GOYT Factor… Get Off Your Tush … and know where your market is, go to it, and connect. If you are in a writing group, access it quickly. They can be great for honing craft and brainstorming. But, if you are surrounded by writers who just love to write, who really don’t care if their work gets publishing, you are in the wrong group. I think authors should learn how to brand themselves as authorpreneurs. PR people and marketing by companies will not help if authors do not participate in those efforts. Man, that’s a good article. I don’t know if I can become a speaker/author with my fiction book, but I’ll definitely consider it. Thanks. Marco—there’s no reason why you can’t. Within your book–there’s a plot that included some level of expertise that you have/developed. Many times, that can be used as a talking point–both with media and to develop speeches around. Thank you I learned somethings! Hello Leslie … first of all, you start calling yourself a Speaker and Author. In your social media profiles, on your biz cards, on your website … everywhere. Kids (and their age span) are very different than adults. Kids need lots of interaction, visuals–they get squirmy fast. If you are going for kids, librarians and schools are your window. ID other authors who are speaking in your area–check out their websites … if they are active, clues will ooze out for you on where they are–and marketing ideas/pitches. For adults … it’s a huge difference. You need to ID your market segment–are you going for small or large groups; corporations or associations; male or female dominated industries … what? You need to develop a PITCH that can be delivered in 15 seconds or less that IDs your expertise, and what you/your book delivers. Thank you for the advise, Judith! Hi Judith, I LOVE this article. Many timely nuggets for me as a newly self-published author. One question-about speaking, how do you get started with that? I was at a local writer event and during the lunch break I was conversing with several women around me. Several asked for my card and wanted to know if I would come speak to their middle school class/college class/ and 2 writing groups about creating your own paranormal world creatures (no vampires or shifters) which is what I’ve with my series. If these opportunities do happen, do you think a talk is better received versus an informal discussion. I think the children would enjoy a brief introduction followed by a discussion. But what about the adults? I do have to say that the event was very energizing and I hope to do more. Thank you.